Area Pastoral Planning is an integral part of the of parish response to the “Call to Conversion and Holiness”, since it enables a group of parishes to find the ways and means to be better Church communities in our Archdiocese within the present realities and in the most authentic and effective manner possible. Area Pastoral Planning allows parishes to learn from the pastoral plans of neighboring parishes, to blend with and support one another’s plans and when advisable, to combine these efforts with other parishes in certain common activities. Through Area Pastoral Planning, a Dean gathers representatives from a group of parishes to reflect prayerfully and to create a dialogue about the vitality of the Church in that area. 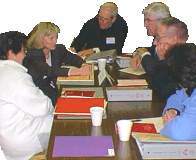 The Dean leads the group in a collaborative process to evaluate whether the parishes, programs, buildings and organizational structures in a given pastoral planning area are of the necessary number, type and variety in light of an in depth evaluation of parish life, staffing, facilities, demographics and financial stability as well as existing Parish Pastoral Plans of that area. In the spirit of ongoing conversion, some change can always be anticipated in Area Pastoral Planning. In some instances, given the realities in a particular area, a parish may need to be founded there, altered, or closed. The same could be said of schools, programs and other parish organizations as the situation warrants. Within each parish, the Parish Pastoral Council is the key structure to foster the full participation of the entire parish (clergy, religious and laity) in the devising of a plan for the pastoral mission of the parish. Members of the Parish Pastoral Council participate in ongoing Pastoral Planning on a parish level and some members participate in the Implementation committees for Pastoral Planning on the larger area level. The adoption of a Parish Mission Statement and the formulation of a Parish Pastoral Plan at the completion of an in depth evaluation of parish life, staffing, facilities, demographics and financial stability are normally fundamental prerequisites for successful Area Pastoral Planning. The Holy Spirit calls the Church to Conversion and Holiness in greater fidelity to her vocation (cf. CCC #821). Parish Pastoral Planning, then, will be repeated periodically to allow for further reflection on and adjustment of the Parish Pastoral Plan. Results and insights from this in depth evaluation of parish life, staffing, facilities, demographics and financial stability are then brought to the pastoral planning activity on a larger area level.